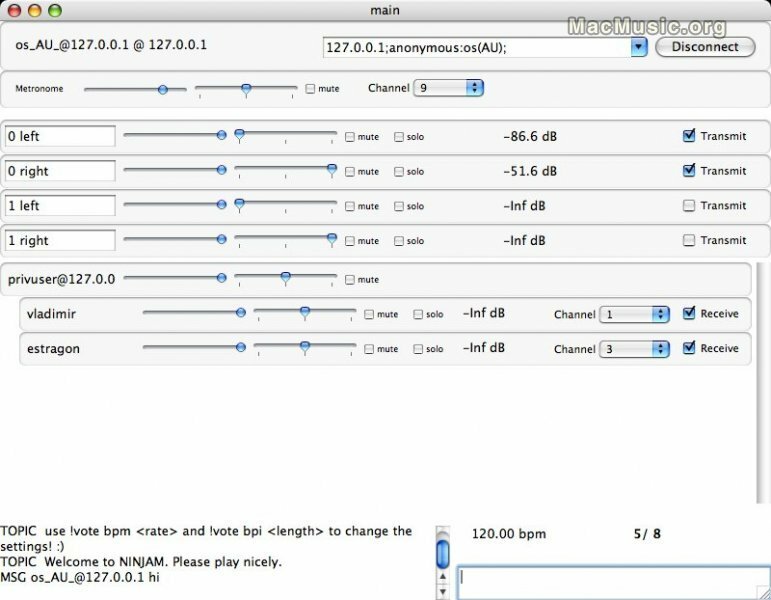 Expert Sleepers has released a plug-in client for NINJAM which is a program to allow people to make music together via the Internet. Every participant can hear every other participant. Each user can also tweak their personal mix to his or her liking. NINJAM is cross-platform, with clients available for Mac OS X and Windows. There are various NINJAM client applications already in existence. Generally though these are designed around the assumption that you're just using the computer to send and receive audio, and that your instruments are just fed into your computer's audio interface. If however your instrument is your computer, it's not really possible to get audio in and out of the Ninjam system in a convenient way. By having the Ninjam client in a plug-in, it makes it very easy to combine Ninjam into your normal computer-based music setup. It also gives you many more creative options for routing signals in and out of Ninjam, even without multi-channel audio hardware attached to your computer. The NINJAM Plug-in is currently available as an AU Universal Binary for Mac OS X; the Ninjam client code is open sourced (GPL) and so is this plug-in so the source code is also available.